The Heel and Toe of Italy is by far the best tour I’ve taken, and I’ve taken many with many other tour companies. Road Scholar surpasses all of the others. This tour taken in Sept. 2014 was delightful from the first day to the last. The sites were gorgeous to look at and fastinating to learn about, the hotels were very clean and nice, the food was varied and delicious, and the guides were intelligent, kind, considerate, and enthusiastic. Their knowledge and their ability to impart that knowledge to us was truly impressive. They love their region and as a result I now love it also. I can’t think of any reason at all that anyone would hesitate to make this tour their next adventure. I was concerned that I would be physically unable to enjoy the tour due to its “active” classification but the activities are seldom more than an hour to an hour and a half and the guides walk very slowly and keep watch so as to pace the tour for all of us to be able to enjoy it. They are wonderful guides and directors. discover the ‘real’ italy. most americans of italan descent emigrated from the ‘mezzogiorno;’ the area in italy from naples and the south. see where many of our ancestors came from. experience the turbulent history, beautiful scenery, amazing architecture, and wonderful food that they left behind! The trip was great. 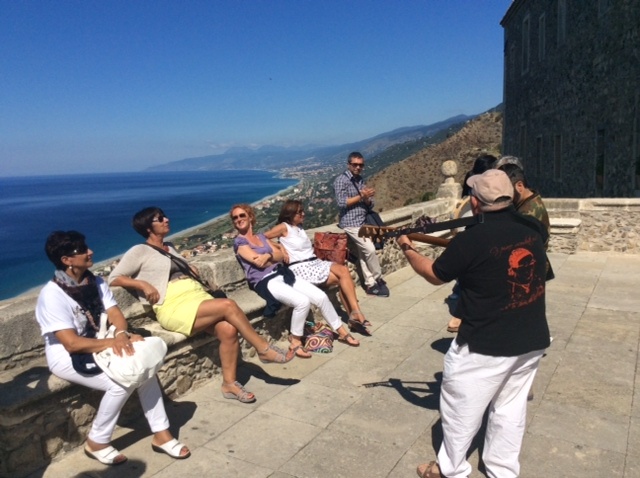 Loved Calabria. Around every bend the landscape changed. Just got better and better. Our local guide was wonderful and informative bringing his own unique experiences to the tour. Plan to go back.